Most false positives (i.e. missing design bugs) during the practice of model checking on industrial designs can be reduced to the problem of a failing cover. Debugging the root cause of such a failing cover can be a laborious process, when the formal testbench has many constraints. This article describes a solution to minimize the number of model checking runs to isolate a minimal set of constraints necessary for the failure. This helps improve formal verification productivity. 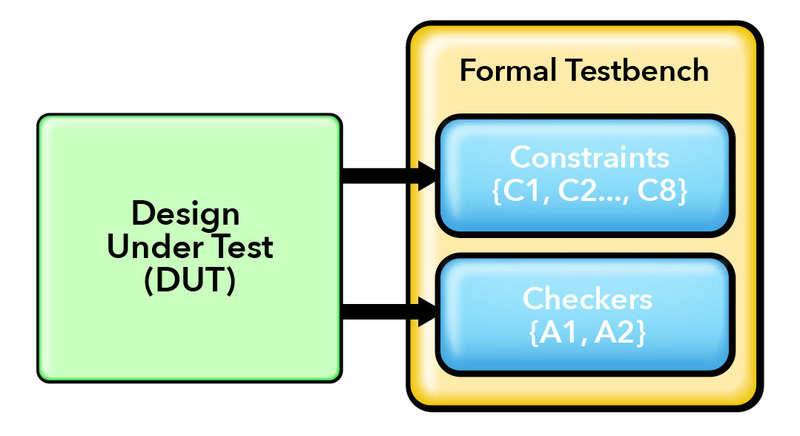 Formal verification in the form of model checking has become an integral part of the chip design sign-off process at many semiconductor companies. The process involves building formal testbenches that can exhaustively verify certain design units. This process complements the simulation testbenches that typically run at full-chip or subsystem level. There can be many reasons why any verification methodology (simulation or formal) can give rise to false negatives or false positives, undermining the confidence built by the verification process. False negatives are typically less worrisome because they are accompanied by a failure report or a counterexample that can be analyzed to determine if the root cause is a design bug. False positives in formal verification are important to eliminate, and often debugging the root cause of such false positives can be very tedious. This topic assumes an even higher importance since formal verification is a newer methodology, and the reasons for false positives are different than in simulation. One of the main reasons for false positives is presence of over- constraints, often resulting in constraints that unexpectedly conflict with each other. The focus of this article is to make it easier to debug such false positives. The proof time for an assert is much faster than expected! For the remainder of this article, we will assume that the formal user is adept at identifying such symptoms and reducing them to a failing cover on the design, although this process in itself can be non-trivial. Debugging the root cause of a failing cover can be a hard problem, especially in formal testbenches that consist of hundreds or thousands of constraints. In all situations we have ran into, such a cover also fails in the presence of a small subset of these constraints, typically between 2 to 5. Once such a subset has been identified, we have usually been able to relate this subset to an unintentional mistake made by the formal engineer. In this article, we describe a method to minimize the number of model checking runs to identify a minimal failing subset (MFS) of constraints. We have run into the problem of debugging vacuous proofs often, and most formal tools do not provide this solution automatically. Therefore it is important that formal users know how to solve the problem manually with minimum effort. To solve the problem, we find the MFS by running the model checking tool multiple times, after modifying a set of asserts, covers or constraints. We will call each such run a step, with the goal of trying to minimize the number of steps. Assuming that the initial failing cover does not incur a large run-time, likely each or most of such steps finish fast too. Nevertheless, since each step requires some human time, we would like to avoid hundreds or thousands of runs, if the number of constraints n is large, i.e. a solution that takes O(n) steps is an unacceptable solution to our problem. To show an application of this problem, we show a simplified version of a real verification example. Consider a design (Fig. 1, shown below) consisting of two source ports A and B, and a single destination port. Note that the interfaces for the A and B are different from each other. The design arbitrates between the two sources under a strict priority scheme of arbitration, i.e., source A is serviced at higher priority than source B. In order to back-pressure the data coming from the sources, the design uses the ready_a output signal on source A interface and the wait_b output signal on source B interface. 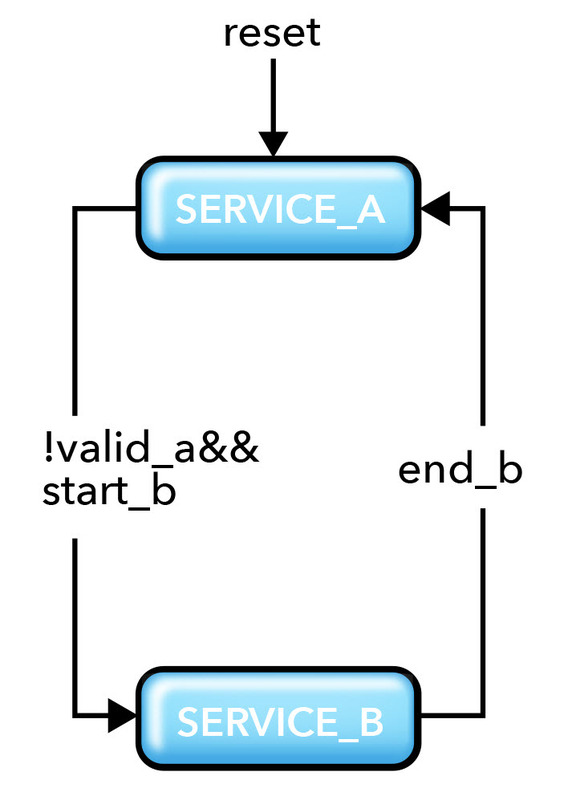 There is a state machine in the design (Fig. 2) that governs which source is being serviced. The outputs ready_a and wait_b remain asserted as long as design arbiter is in SERVICE_A state. Likewise, the output wait_b remains asserted. Fig. 3. 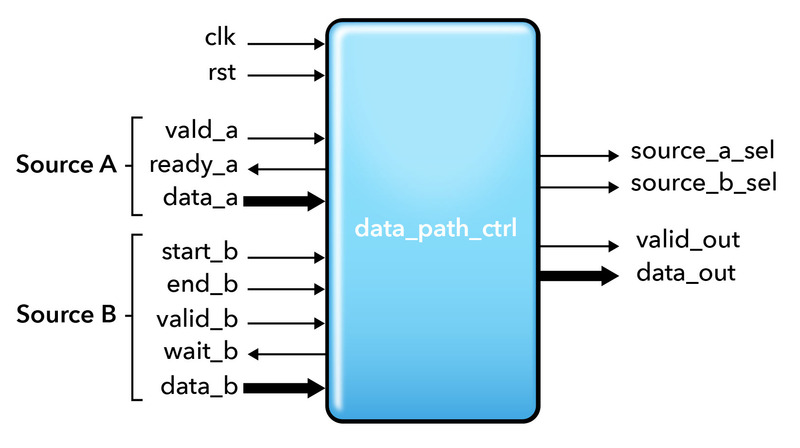 Formal verification setup of Data Path Control design. The formal engineer ended up with the above-mentioned constraints after a typical process of iterating through false failures and adding constraints as needed, and as she developed a deeper understanding of the design and its interfaces. At this point, each of the two checkers A1 and A2 passed after the model checking run. However, the alert engineer noticed that the model checking tool was warning that the checker A2 was passing vacuously. This was a surprising result, and necessitated a debug for the root cause of this vacuous proof. Clearly, there must be some input that must be over-constrained accidentally. Even after a tedious manual review of the hundreds of constraints (of which 8 are mentioned above), it was not clear where the mistake was. 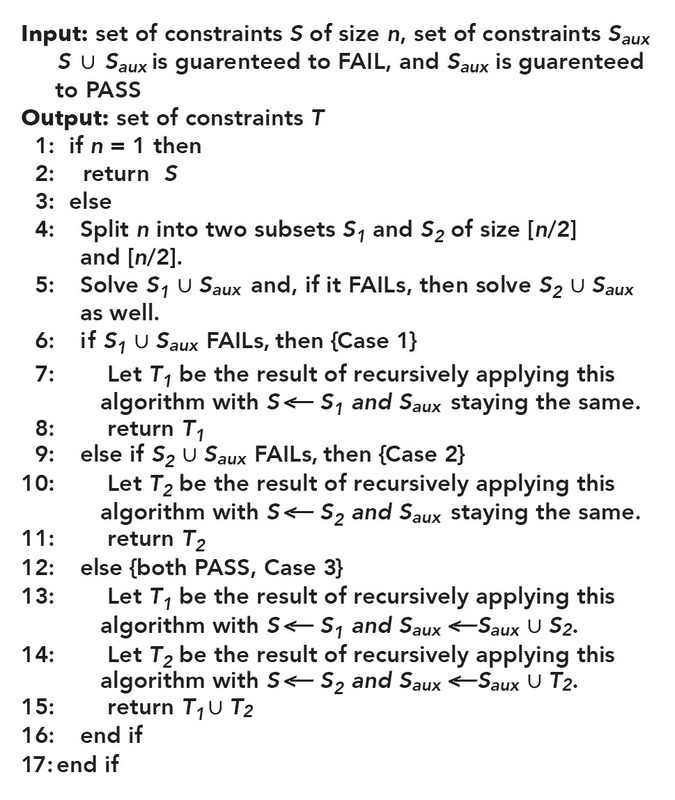 The debug of the vacuous proof in the previous section forced the engineer to identify a minimal subset of constraints that is sufficient to cause the cover to fail. In fact, once she solved that problem, she realized that of the hundred of constraints, C3 and C7 were sufficient to produce the unexpected failing cover. At this point, a manual review of these two constraints was feasible. And she realized that C3 and C7 conflict with each other because in state SERVICE_A, the output wait_b is asserted, and if valid_b is asserted here, C3 will force valid_b to be deasserted in the next clock cycle, whereas C7 will force valid_b to be asserted in the next clock cycle. C3 was the incorrect constraint. And it happened because at some point in the project, she had realized that her understanding of the source B interface was incorrect and needed to be modified to implement that by C7 and C8. But she had forgotten to remove C3 on that interface, which was based on her earlier incorrect understanding! The need to debug failing covers happens enough times during formal verification, and the debug of that is so tedious that we were motivated to solve this problem more efficiently. 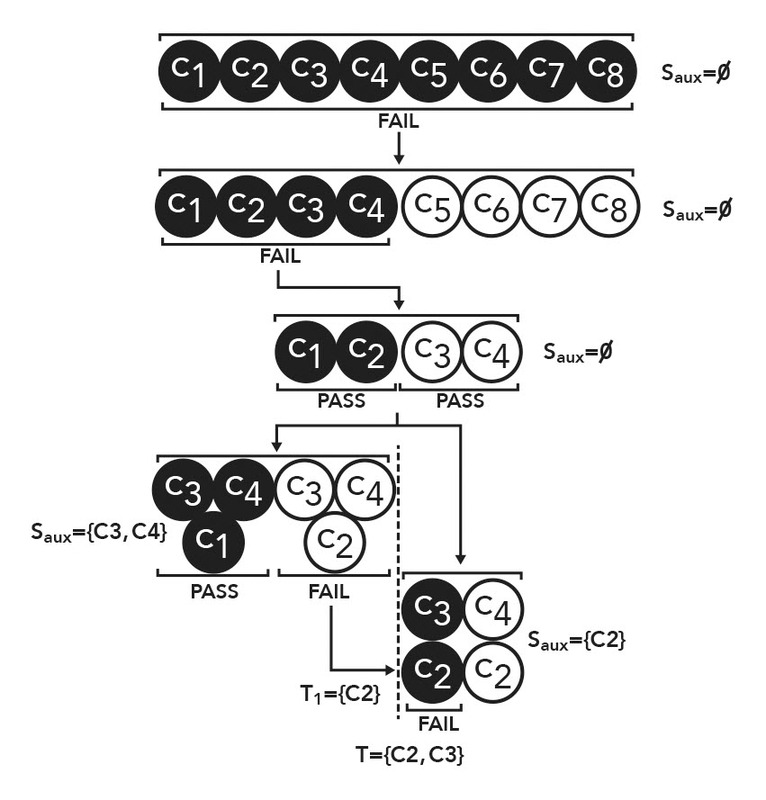 We are given a model checking tool that can verify whether a cover passes or fails on a given design under any set S of n constraints (the cover is said to fail if the model checking tool proves the cover is unreachable, and it is said to pass if the tool finds a witness to reach the cover from reset). To avoid verbosity, if the cover passes, we will say S PASSes; conversely, if the cover fails, we will say S FAILs. The goal is to find any minimal FAILing subset (MFS) of S using as few steps as possible. Fig. 4 and 5 illustrate some example cases. Fig. 4. A sample case where m = 1 and n = 8. Fig. 5. A sample case where m = 2 and n = 8. 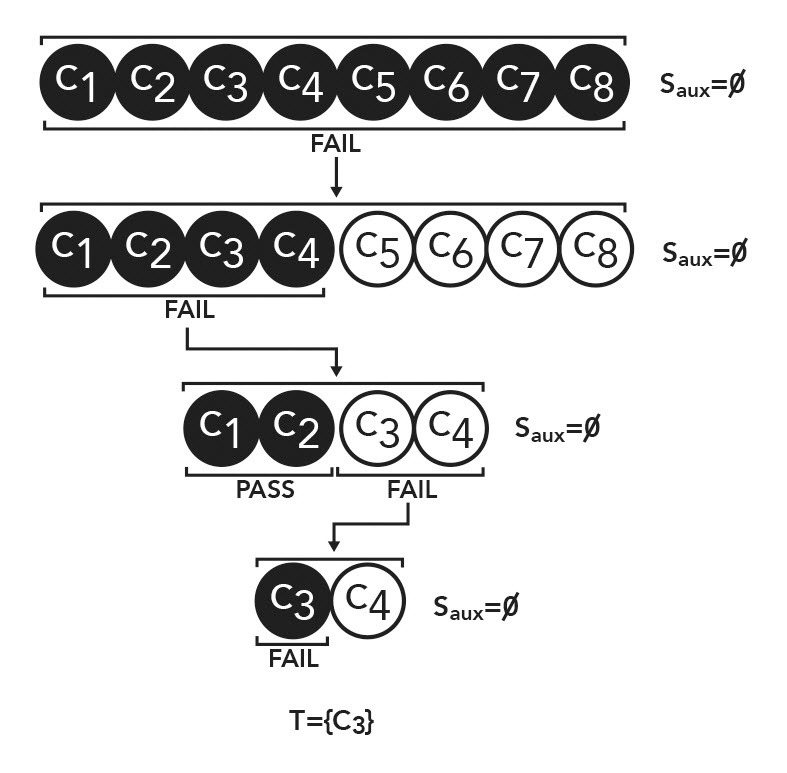 A similar algorithm to solve this problem was published earlier by Junker 1 . Both Junker’s algorithm and ours have the same worst-case complexity O (m log n). We implemented both his algorithm and ours, and the results appear in Table 1. When there is only one MFS, i.e. there is only value of m, both Junker’s algorithm and our algorithm take similar numbers of steps. However, when there are multiple MFSes, especially when they are disparately sized, our algorithm runs in far fewer steps than his. This is because his algorithm is biased towards finding an MFS which contains lower-numbered constraints even when such an MFS may be much larger than an MFS that contains only higher-numbered constraints. This puts his algorithm at a disadvantage. The article discussed a solution that requires O (m log n) steps of model checking runs to find the minimal FAILing subset of constraints; since typically m << n, this is useful. This solution has increased our productivity by reducing the iterations required to debug vacuous proofs. 1 Junker, Ulrich. “QUICKXPLAIN: preferred explanations and relaxations for over-constrained problems.” AAAI. Vol. 4. 2004. Welcome to the 10th Anniversary edition of Verification Horizons!